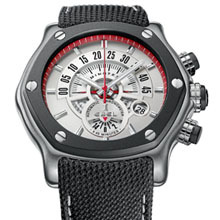 Ebel, football’s premier luxury watch brand, has taken another significant step in its commitment to the world’s number one sport with the launch of the 1911 Tekton Ajax Limited Edition 150 pieces. 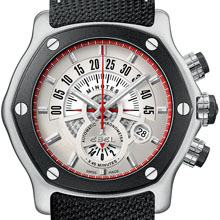 Following the spectacular success of the Arsenal FC and FC Bayern Munich limited edition chronographs, with this new timepiece, the Architects of Time have consolidated their relationship with the famous Dutch club AFC Ajax, the architects of Total Football. The style of play with which Ajax won the European Cup for the first time in 1971, beating Panathinaikos of Greece in front of 90,000 people at Wembley Stadium, was an imaginative fusion of highly skilled craftsmanship and freedom of expression. Total Football, as it became known, rejected conventional playing patterns and encouraged footballers to push the boundaries and explore new possibilities. Led by legendary coach Rinus Michels and famous players such as Johan Cruyff and Johan Neeskens, it was an approach which was not only successful but the most aesthetically pleasing form of the game ever seen in Europe. Ajax went on to win the European Cup three times in succession following that first triumph in London, while the Netherlands, using the same style, reached the World Cup finals of 1974 and 1978 before winning the European Championship ten years later. Ajax, who won a fourth European crown in 1995, were founded in 1900 and eleven years later, the year of Ebel’s foundation, they wore for the first time the famous white shirts with a broad, vertical red stripe that has become such a symbol of the club and of footballing excellence. Against the backdrop of a silver dial with red flange, the 1911 Tekton Ajax pays homage to this with a dedicated white and red “Ajax” hour-marker at 12 o’clock, a detail that typifies Ebel’s approach to designing high-level football watches. Ebel has also demonstrated its deep and lasting commitment to football by developing a proprietary movement specifically designed for all of its football watches, keeping effective track of football match time. This exclusive chronograph movement was developed by Ebel watchmakers and is assembled and tested in-house in its La Chaux-de-Fonds workshops. Designed to measure match half-times and code-named “245” , standing for 2 x 45 minutes, it even indicates extra time where required. 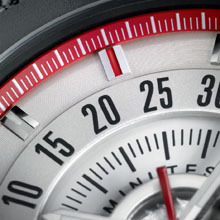 The oversized 45-minute counter at 12 o’clock on the watch dials serves to read off elapsed time, while the disk at 6 o’clock indicates the hours in periods of 45 minutes. Doubtless the most distinctive feature of all is the signature football-shaped oscillating weight, personalized with the corresponding club logo and numbered according to the limited editions, which in the case of Ajax is 150.